(March 7, 2016)–More than 140,000 people from around the world have joined with an international coalition of advocacy organizations including SumOfUs, CODEPINK Women for Peace, American Muslims for Palestine, the US Palestinian Community Network, the US Campaign to End the Israeli Occupation, and Jewish Voice for Peace in demanding that Airbnb immediately end the illegal practice of listing properties in Israeli settlements in the occupied West Bank on its vacation rentals website. According to international law and official US policy, Israeli settlements in the West Bank are illegal. The Israeli settlement enterprise is part of a decades-old military occupation that has confiscated 42% of Palestinian land for settlement construction, resulting in the loss of freedom of movement and other severe human rights abuses against the Palestinian people. 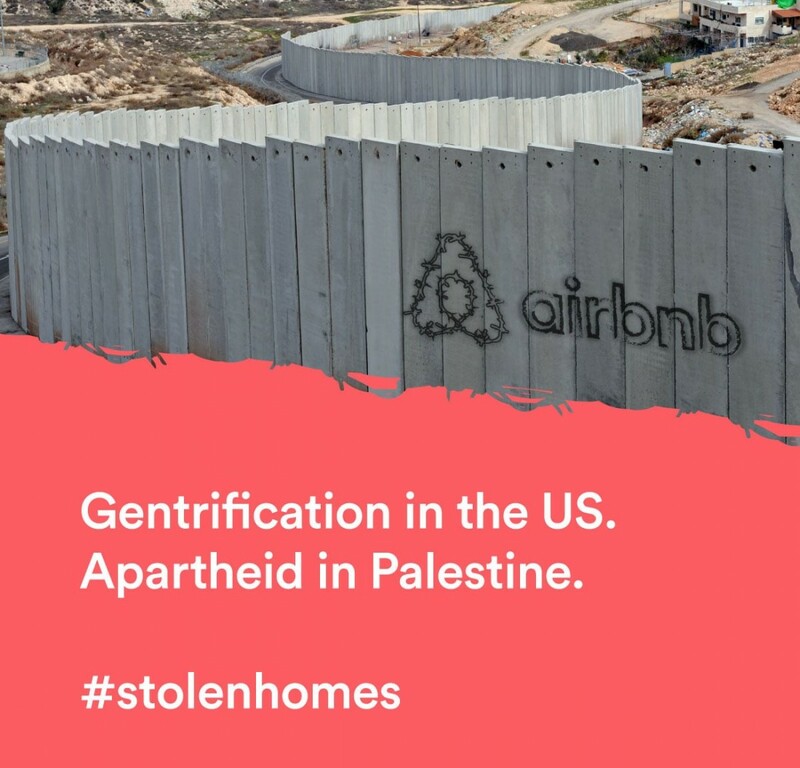 By listing rentals in Israel’s illegal settlements, Airbnb facilitates and benefits from the transfer of Israeli civilians into occupied territory, which is forbidden under international law. Earlier this year, the Associated Press reported that Airbnb had been allowing Israeli settlers in the West Bank to list their homes as “in Israel” with no mention that they are on occupied Palestinian land. In addition to misleading potential renters and aiding the Israeli government in laying permanent claim to all the land under its control, some of the proprietors have explicitly discriminated against people with Arab or Palestinians names, in direct violation of Airbnb’s stated policies. The coalition has also launched a new microsite parodying Airbnb rental listings and calling attention to the the fact that the vacation rental company continues to list Israeli settlements in the West Bank. “People around the world are waking up to the immorality of settlement profiteering, and it is unclear why Airbnb continues to risk its brand’s reputation through its involvement in illegal activities in the Occupied West Bank.” added Nancy Kricorian, CODEPINK Women for Peace. “We are getting closer and closer to our Palestinian people’s liberation, so it is essential for Airbnb to know that it will be on the wrong side of history if it continues to support apartheid policies and violations of Palestinian rights,” said Hatem Abudayyeh, national coordinating committee member of the US Palestinian Community Network. “July 2005 marked 10 years since Palestinian civil society issued a call for boycott, divestment, and sanctions (BDS) campaigns to push companies to end their complicity in Israel’s military occupation and apartheid policies. There have been hundreds of BDS wins worldwide as activists have pushed institutions to reject business as usual with Israel until Palestinians achieve freedom, justice, and equality. Airbnb needs to do its part and stop profiting from settlements that have time and again been declared illegal and major impediments to justice for Palestinians and a sustainable peace,” said Ramah Kudaimi of the US Campaign to End the Israeli Occupation. Jewish Voice for Peace (jvp.org) is a national, grassroots organization inspired by Jewish tradition to work for a just and lasting peace according to principles of human rights, equality, and international law for all the people of Israel and Palestine. Jewish Voice for Peace has over 200,000 online supporters, over 60 chapters, a youth wing, a Rabbinic Council, an Artist Council, an Academic Advisory Council, and an Advisory Board made up of leading U.S. intellectuals and artists. The American Muslims for Palestine is a national education and advocacy organization, whose mission is raise awareness about Palestine’s rich cultural, historic and religious heritage in attempts to build a grassroots movement that will urge Congress to create a more fair and balanced foreign policy for everyone in the Middle East. The US Campaign to End the Israeli Occupation is a national coalition of hundreds of groups working to end all U.S. support for Israel’s military occupation and apartheid policies toward Palestinians. We stand for freedom, justice, and equality. The U.S. Palestinian Community Network is a Palestinian community-based organization founded in 2006 to revitalize grassroots organizing in the Palestinian community in the U.S. as part of the broader Palestinian nation in exile and the homeland.